HANGZHOU, Feb. 27 (Xinhua) -- China, Russia and India on Wednesday agreed to enhance coordination and cooperation, firmly uphold multilateralism and jointly fight against terrorism. 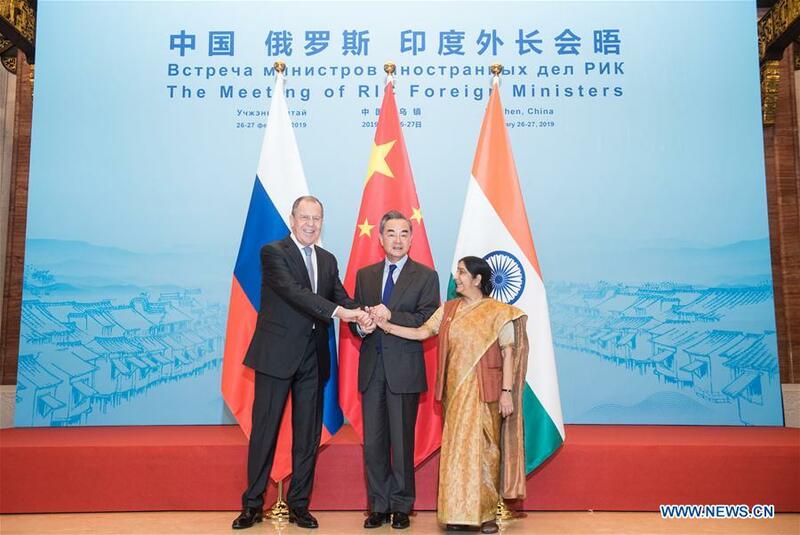 The agreement came as Chinese State Councilor and Foreign Minister Wang Yi, Russian Foreign Minister Sergei Lavrov and Indian External Affairs Minister Sushma Swaraj held the 16th meeting of the foreign ministers of China, Russia and India in Wuzhen, eastern China's Zhejiang Province. Noting that the world today is undergoing unprecedented changes that have not been seen in the past 100 years, Wang said China, Russia and India, as influential major powers and important emerging economies, should enhance coordination, converge consensus, cement cooperation and jointly promote world peace and stability. Wang said leaders of the three countries successfully held a meeting in Argentina last November, which pointed out the direction for and provided a strong impetus to trilateral cooperation. He suggested that the three countries should firmly safeguard the international system with the United Nations (UN) as the core, and adhere to the principle of non-interference in internal affairs and deepen counter-terrorism and security cooperation. It is necessary to resolutely oppose unilateralism and protectionism, continually push forward the liberalization and facilitation of trade and investment and promote the construction of an open world economy, said Wang, adding that all of the three countries have proposed their initiatives of connectivity, and they should cooperate with each other and jointly promote the process of regional integration. Lavrov and Swaraj said the international community should observe the principle of the UN Charter and comply with the norms of international laws and relations. They called on the three countries to give full play of multilateral platforms including the UN to further strengthen coordination and cooperation and make joint contributions to properly handle international and regional hotspot issues and tackle challenges facing humanity. After the meeting, the three countries released a joint communique. The three foreign ministers also attended a joint press conference and conducted in-depth exchanges of views regarding the current international situation and trilateral cooperation. The three sides agreed to jointly combat all forms of terrorism, enhance communication over counter-terrorism policy and practical cooperation and will especially make efforts to eradicate terrorism and extremism. On the Venezuela issue, they said it should be settled by Venezuelan people through constructive dialogue rather than resorting to violence, and military intervention is opposed. The three sides also agreed to constantly consolidate and expand trilateral practical cooperation, and work on setting up a meeting mechanism among their defense ministers in an appropriate time. China also proposed to discuss "China, Russia, India plus" cooperation, so as to improve global influence of the trilateral cooperation. The next meeting between three foreign ministers will be held in Russia, Wang said.